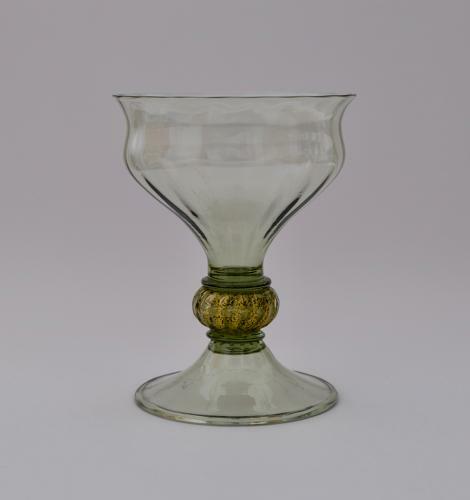 Large sea green goblet with optical ribbing and large the knop with gold foil inclusions. Folded conical foot. designed by Harry Powell 1911-19 pat no 1406. Designed 1911-19. Illustrated in Whitefriars Glass 'The Art of James Powell & Sons' Edited by Lesley Jackson 1996. p.113, plate 76. Note: Embedded gold inclusions was a technique developed by Harry Powell in 1879 but was not widely used until 1899.